Android Oreo already has the equivalent characters, and although the vast majority of Android users aren’t yet running that version of the software, app developers are now able to build in support for new emoji even for people on older Android builds. It’s not clear exactly when Apple plans to release iOS 11.1 or versions of macOS and watchOS containing the new emoji, but they’ll be available in the beta version of iOS 11.1 next week. The animals section is growing with the addition of a giraffe, a zebra, a hedgehog, what looks like a Brachiosaurus, and an insect that I think is a cricket but might be a grasshopper. If there are any paleontologists or entomologists reading, let me know your thoughts. Autumn is here, winter is coming, and emoji are preparing you for the cold season with characters including gloves, a scarf, a trenchcoat, and a baseball cap. The Chinese takeout box emoji joins the long-awaited dumpling emoji in Unicode 10, along with broccoli and a pie of unknown provenance. These emoji are designed to be gender-neutral and will be available in various skin tones. There’s going to be a new orange heart emoji, meaning you can spell out a full rainbow of love for anyone who doesn’t distinguish between indigo and violet. These mythical emoji are presumably designed to expedite the process of arranging D&D sessions. Smiley faces get a whole lot more expressive in Unicode 10, running the gamut from foul-mouthed anger to calm pleas for silence. Fans of curling, rock climbing, and spas should be happy with these “wellness”-related additions. 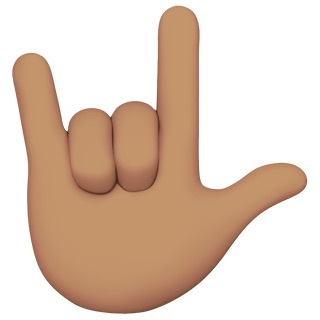 Finally, and not to be confused with the metal horns character added a couple of years ago, this new emoji means “I love you” in American Sign Language. It’s a meaningful addition for ASL users, and one that activists have wanted Unicode to add for years.